1 drawing on paper, lined and laminated : ink ; 6 x 9.375 in. Ink drawing of five men, identified by inscriptions, sitting around a table inside a large tent. Man, Kagawa, in shorts and undershirt sits on bench with legs drawn up to chest and right hand on table next to man with hat and back to viewer, Hata, who leans on table at center. On right a man, Arita, leans on left elbow while looking across table to Ikeda, a man in a hat and glasses with back to tent opening ; seated between is Aigawa, a bald man partially visible. Tent pole in center of table with bare light bulb hanging down. Tent is composed of wooden floors, low wooden walls of four planks and rolled window flaps, and material roof. Door flaps are tied open, providing view of guard tower in distance. Written in black ink, on each man (clockwise from left): Kagawa, Ikeda, Aigawa [? 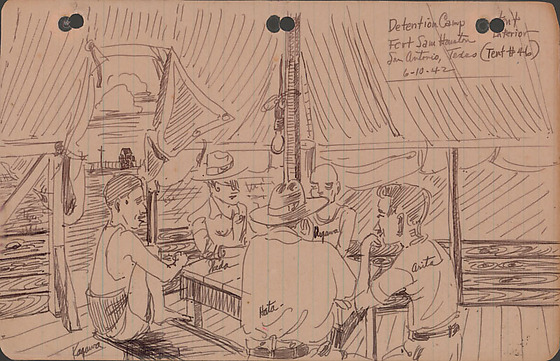 ], Arita, Hata-- Written in black ink, top right corner: Detention Camp tent / interior / Fort Sam Houston / San Antonio, Texas (Tent #46) / 6-10-42.